Last Wednesday, Politico Pro reported on a proposal under consideration by key members of Congress’s Joint Select Committee on Solvency of Multiemployer Pension Plans. 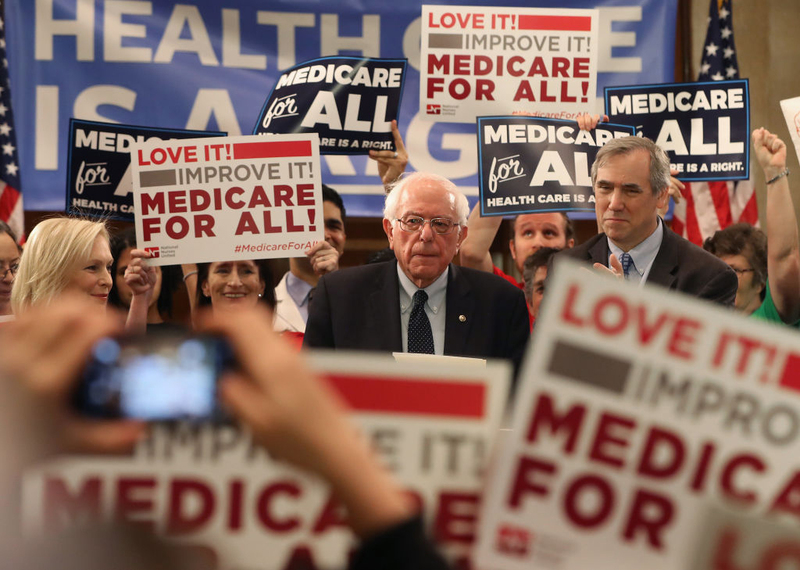 As the Washington Post described it, “top lawmakers are considering a taxpayer-funded bailout for retirees who are members of certain failing pension plans.” The purpose of this article is to explain salient features of the proposal, as well as ways that it might be improved. First, some background: the proposals on the table concern multiemployer pension plans, or private-sector defined-benefit pensions typically co-sponsored by multiple employers in a common industry, established under a collective bargaining agreement with a labor union. There isn’t space here to review all the key aspects of such plans; readers interested in this background can read my study published by the Mercatus Center as well as a more recent piece for e21. Suffice it to say that these plans have become dangerously underfunded—more than $600 billion in underfunding (Figure 1)—threatening the solvency of the US pension insurance system operated by the Pension Benefit Guaranty Corporation (PBGC). PBGC is a federally-chartered corporation set up to insure these pension benefits, and is financed by premiums paid by plan sponsors specifically so that taxpayers are not called upon to do so. The foundational premise of the PBGC system is that employers should both fund and insure the pension benefits they promise to their own workers. 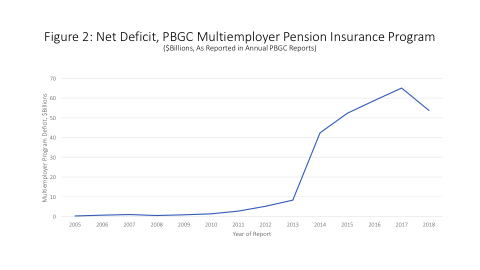 A $54 billion deficit (Figure 2) and projected insolvency of the PBGC multiemployer insurance program threatens over 10 million American workers with the loss of vital pension benefits, for the simple reason that if the PBGC goes under, many workers’ nominally insured pension benefits would not be paid. A key challenge facing the select committee is to shore up the solvency of multiemployer pensions so that failing plans don’t swamp the PBGC. This is the nub of the problem, though it also involves several other important factors beyond the scope of this piece, such as the nature and limits of PBGC insurance coverage, and the circumstances in which it comes into play. Before describing the draft proposal, it’s important to understand key causes of the multiemployer pension crisis. Many factors have contributed to the crisis, but the leading one is that federal law has permitted multiemployer pension sponsors to mismeasure their plans’ assets and liabilities, and to fail to fund their payment obligations—and unfortunately, that is exactly what many sponsors have done. Specifically, multiemployer plan trustees routinely disregard a longstanding consensus among economists as to how to properly measure pension liabilities, instead using distortive methods that their single-employer counterparts are statutorily prohibited to employ. 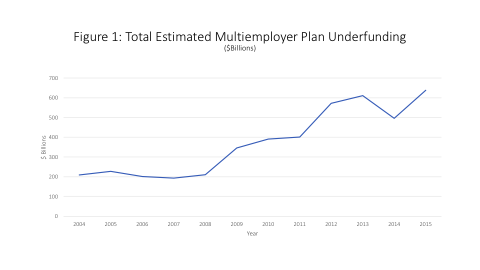 This practice has resulted in multiemployer plan trustees promising benefits far exceeding what employers’ contributions can fund, and in multiemployer pension insurance heading toward insolvency at the very same time that the single-employer system is strengthening (Figure 3). Federal law has exacerbated the problem by the way it treats so-called “orphan workers” in multiemployer plans—that is, workers whose employer has withdrawn from sponsoring a plan (whether by going out of business or for any other reason). The way things are supposed to work is that a withdrawing employer makes a withdrawal payment sufficient to cover its share of the plan’s unfunded vested benefits, after which the remaining sponsors assume responsibility for paying benefits to the withdrawing employer’s former workers. But in practice, there are so many loopholes in the withdrawal liability rules that whenever sponsors exit multiemployer plans, the remaining sponsors are usually left holding the bag for worsened funding shortfalls. There are plenty of other problems as well, which I have written about elsewhere. But in general, the funding rules bearing upon multiemployer plans are inadequate, as are the premiums that multiemployer sponsors are assessed for PBGC insurance coverage. No solution to the multiemployer pension crisis will likely last unless it fixes these problems—including specifically its measurement inaccuracies, lax funding rules, and inadequate withdrawal obligations that give rise to mounting orphan liabilities. Unless these are fixed, underfunding in multiemployer pensions will almost certainly continue to grow, threatening workers with benefit losses and taxpayers with the costs of escalating bailouts. The draft proposal in circulation would basically tackle the problem by relieving certain plans of their so-called orphan liabilities at PBGC expense. 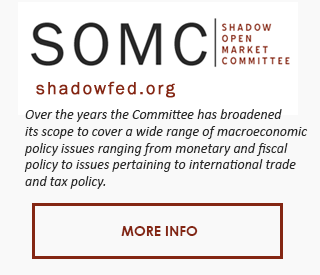 PBGC would assume obligations to pay the benefits of orphan workers, and would finance these new obligations through a combination of increased premiums assessed on pension stakeholders, and direct federal funding financed by US taxpayers. 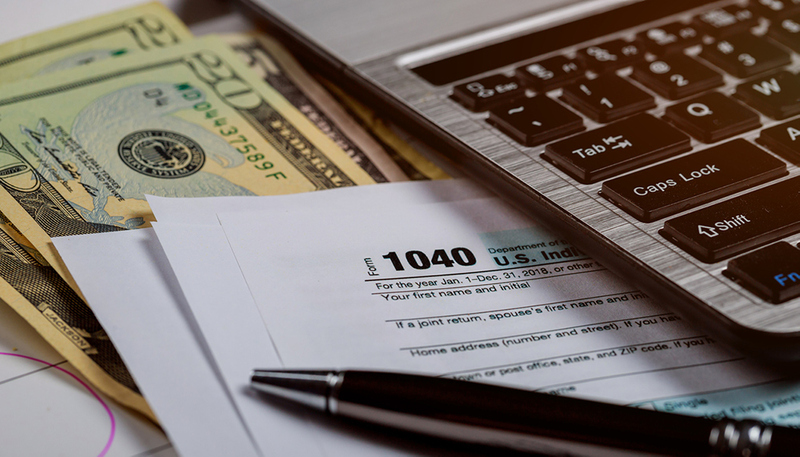 Under the draft proposal circulated last Wednesday, federal taxpayers’ contributions could be as high as $3 billion a year, or $30 billion over ten years. It should be said that the multiemployer pension crisis has already grown to such a size that there are no good options facing the committee. The test of a proposal is not whether it achieves policy perfection, but whether it is better than the status quo. And, in the multiemployer system, the status quo is pretty terrible: a $54 billion deficit facing the PBGC, and many workers losing nearly all of their benefits once PBGC becomes insolvent within ten years. That said, while the proposal improves upon current law in some respects, it worsens matters in several others. To produce a demonstrable improvement over current law, the following fixes should be considered, in rough order of priority. #1: Fix the discount rates used to convert pension liabilities into their present values. This should be priority #1 in pension reform. It is difficult to imagine any solution holding unless this is done. If employer sponsors won’t even acknowledge their plans’ liabilities, they certainly won’t fund them. And if they don’t fund them, there will be bigger and more expensive bailouts down the line. It is reasonable for plan sponsors to argue that the situation is already so bad that extreme measures must now be considered—including federal taxpayers bailing sponsors out of their pension promises—because otherwise the pain inflicted on workers will be too great. But it is not reasonable for sponsors to both demand a bailout and yet insist on continuing the misreporting of pension liabilities that fostered the problem in the first place, and which will lead to further bailouts if continued. An argument from some sponsors is that correctly measuring pension liabilities will result in too-onerous funding contribution requirements, inducing many sponsors to simply fold their plans. First, this is untrue; liability measurements and contribution requirements are two different things. Lawmakers can enact any contribution requirements that they choose, without necessarily resorting to papering over plans’ liabilities. Second, even when it is true that a sponsor cannot afford to continue a plan once its liabilities are correctly booked, this simply means that the plan is on an irretrievable course to insolvency and is best terminated sooner, rather than later and more expensively. We don’t make a plan’s unfunded liabilities go away simply by refusing to acknowledge them. 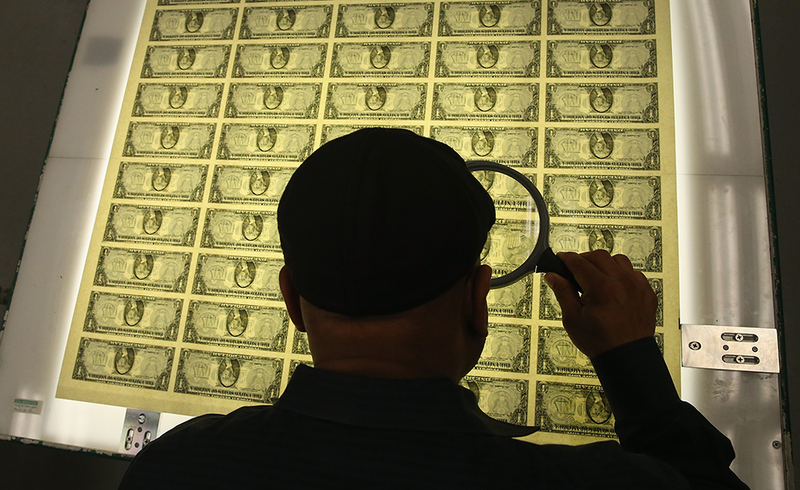 There is some disagreement among economists as to whether multiemployer plan liabilities are appropriately discounted at Treasury bond rates, corporate bond rates, or something in between. However, there is general agreement that they should not be discounted at rates exceeding those reflected in a yield curve of corporate bond rates. It is especially important that the federal government not bless the use of inflated discount rates, as the draft agreement would do. If that is done, sponsors in other systems (like single-employer plans and state/local pensions) will demand similarly inflated rates, and it will become much harder to hold plan trustees throughout the pension world accountable when they violate fiduciary responsibilities by inaccurately measuring their liabilities. The discount rate issue comes down to a simple consideration: if plan liabilities aren’t properly measured, they won’t be funded, and legislators will face additional taxpayer-financed bailouts in the future. #2: Limit relief to orphan worker benefits only. The case for deploying PBGC resources to relieve plans of their orphan liabilities is that the federal government is complicit—through its inadequate withdrawal liability rules—in causing those orphan liabilities to arise in the first place. But the weakening of PBGC finances by taking on orphan liabilities is only cost-effective if continuing plans are committed and fully able to fund their other benefit obligations once their orphan liabilities are removed. The draft proposal would have the PBGC assume obligations for paying benefits not only to orphan workers, but other plan obligations up to 25% over and above orphan liabilities. These added obligations would weaken PBGC and would be an unjustified gift from taxpayers to plan sponsors. Sponsors should not be permitted to shift their responsibilities for funding their own workers’ benefits to other sponsors or to the US taxpayer. If a plan truly isn’t sustainable without this level of subsidy support, it will ultimately need to be terminated anyway. #3: Don’t increase PBGC benefit guarantees. The multiemployer pension insurance system faces a huge $54 billion deficit under current law, despite tight limitations on the benefit levels it insures. The draft proposal would substantially increase PBGC’s benefit guarantees, nearly doubling them in some cases. By itself this would worsen the PBGC solvency outlook; moreover, underfunding throughout the multiemployer pension system is incompatible with this coverage expansion. PBGC’s resources are inadequate to finance its current-law guarantee levels, let alone much higher ones. Again, while it is reasonable for some plan sponsors to argue that extreme measures must be considered in view of the critical situation, it’s not reasonable to simultaneously advocate for PBGC’s guarantee levels to be increased when PBGC cannot provide for those under current law. #4: Don’t use federal taxpayer funds. The proposal would be improved enormously if PBGC’s finances could be stabilized without drawing upon taxpayer-financed funding. The foundational premise of the PBGC system is that these are private-sector compensation promises made by employers and unions to their workers, which taxpayers had no role in negotiating. The benefits should therefore be guaranteed through privately-financed insurance, not with federal taxpayer dollars. 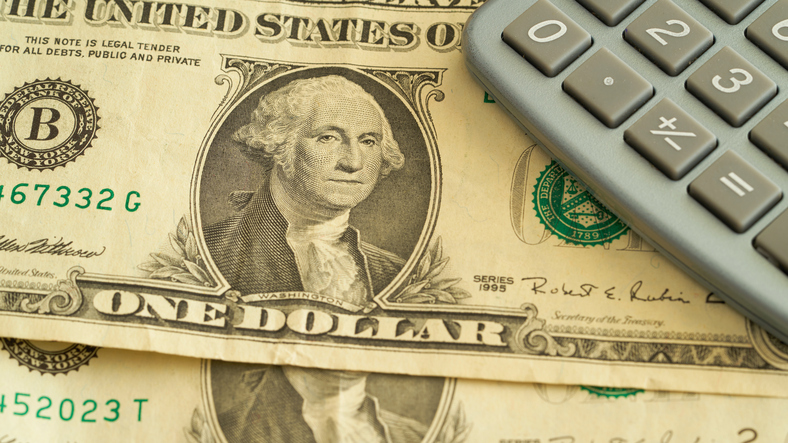 Taxpayer funding is particularly problematic in the context of a proposal that would allow sponsors to mismeasure their liabilities while also receiving increased PBGC benefit guarantees for their own workers. Even the most conservative of policy makers might perhaps be persuaded that some taxpayer funding could be part of a solution preferable to the status quo, if it solves the multiemployer pension solvency problem for good. But it’s very difficult to justify taxpayer funding when other elements of the proposal would almost certainly lead to future federal bailouts—of multiemployer plans, and potentially of troubled state/local plans as well. #5: Reform the funding rules. Absent thus far from the draft outline is significant reform of the funding rules bearing upon multiemployer plans. Unless those are reformed, underfunding in these plans will likely continue to balloon. The 2006 Pension Protection Act, which successfully strengthened the single-employer system, effectively exempted critically underfunded multiemployer plans from compliance with funding rules, by waiving the excise tax that would otherwise apply to such funding failures. 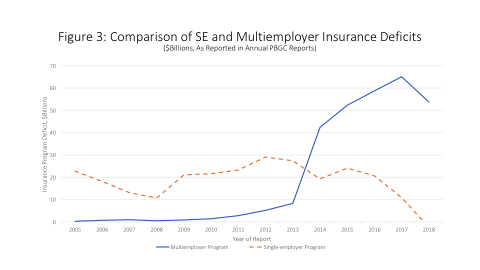 The PPA’s excise tax waiver exacerbated the multiemployer crisis, leading to severely underfunded multiemployer plans making even fewer contributions than better-funded plans, and should be repealed. Multiemployer plans should have a clear, uniform schedule for amortizing underfunding, without loopholes or exemptions. If plans cannot progress toward full funding over a reasonable time frame, then arrangements should be made to minimize the costs of their inevitable terminations. Without such funding reforms, many more multiemployer plans will become insolvent in the future, further straining the resources of PBGC and triggering calls for additional bailouts. These five issues are by no means the only significant ones with the draft outline: another issue is that the outline would steer plans heavily in the direction of paying benefits they cannot afford, by requiring that plans “true up” total benefit payments when the PBGC provides orphan liability relief. It would be more appropriate to require that plans limit benefits, for orphans and non-orphans alike, to levels that can be fully financed when properly measured. It would also be appropriate to require sponsors receiving taxpayer-financed orphan liability relief to adjust their other benefit promises, to achieve shared sacrifice and to ensure that their plans not further drain the nation’s pension insurance system. There are some positive aspects to the outline: the approach of partitioning plans to relieve them of orphan liabilities is a promising one, as I have previously written. And the proposal contains positive (if incomplete) reforms in areas such as premium assessments (including variable-rate and exit premiums), constraints on benefit promises by underfunded plans, and withdrawal liability rules. On balance, however, the draft proposal is more likely to represent a down payment on eventual future bailouts than a solution to the multiemployer pension problem. Negotiators would do well to require at the very least that any legislation correct multiemployer plans’ liability measurement practices, as well as remove other problematic features of the draft proposal—such as using taxpayer funds to increase guaranteed benefits for non-orphan workers—as they work toward a viable, bipartisan solution.